The Cincinnati Kid is to poker what The Hustler was to pool, a fascinating suspense study of masters at work. Steve McQueen brings his cool fire to the role of Cincinnati Kid, a small-timer eager to take his chance in high-stakes poker. He gets his chance. Regal, ruthless, Lancey Howard (Edward G. Robinson), the elite gambler called the Man, accepts the Kids’s challenge. Norman Jewison (In the Heat of the Night, Moonstruck) directs this taut exploration of back-room gaming, building suspense with each turn of a card. Ann-Margaret, Karl Malden, Rip Torn, Joan Blondell round out a stellar cast. Steve McQueen brings his cool fire to the role of the Cincinnati Kid, a small-timer eager to take his chances in high-stakes poker. He gets his chance. Regal, ruthless Lancey Howard (Edward G. Robinson), the elite gambler called the Man, accepts the Kid’s challenge. Norman Jewison (In the Heat of the Night, Moonstruck) directs this taut exploration of back-room gaming, building suspense with each turn of a card. And Ann-Margret, Karl Malden, Rip Torn, National Board of Review Best Supporting Actress Award winner Joan Blondell and many more comprise a full house of talent. Grab a chair and ante up. 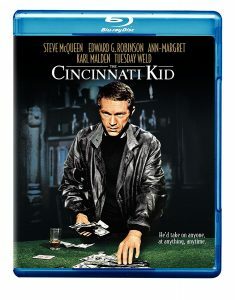 Steve McQueen leads an all-star cast in this story of an up-and-coming young poker player out to make a name for himself when the long-time master of the game comes to town–a young poker player who will stop at nothing to become the greatest as The Cincinnati Kid. New Orleans. The Great Depression. Eric Stoner (McQueen–Bullitt, The Sand Pebbles), known as The Cincinnati Kid, loves life, women . . . but most of all he loves poker. Now, when poker champion Lancey Howard, known as The Man(Edward G. Robinson), comes to town, Stoner arranges for a place at a game with Howard. But when he learns that the dealer has rigged the game for Howard to lose, Stoner insists, that win or lose, the game be fair.